Home / Posts tagged "blueberries"
The interest and reporting on health has been revolutionary in driving the key messages about the importance of diet and exercise, but have the scales started to tip in the wrong direction? The basics of good heart health have remained relatively unchanged in that eating a balanced diet and keeping active are key drivers in reducing the risk of disease. The problem is that the definition of what constitutes a ‘balanced diet’ continues to get redefined as we have become obsessed with the ‘micro’ issues and controversies surrounding this topic. The consequence of this is that key health messages, which are based on science, have become blurred and cause confusion amongst people on what they should be eating. We all know what a healthy diet should look like. To keep healthy, our diet should include plenty of vegetables, lean proteins, oily fish, high-fibre foods such as beans, pulses and lentils and ‘brown’ carbohydrates over ‘white’. Foods and drinks that are in high in sugar and saturated fat such as puddings, desserts, confectionary, soft drinks, convenience foods, pies and pastries are perfectly fine in moderation but when eaten to excess, especially in place of healthy alternatives are not good for health. Simple right? If you follow these principles and control the amount of food you eat then there’s no doubt that you’ll be able to retain a healthy body weight, glean enough micronutrients (vitamins and minerals) and protect yourself against diet-related diseases. Yet many adults still fail to achieve this. What does the current adult UK diet look like? The National Diet and Nutrition Survey (NDNS) is a rolling program that assesses the dietary intake of the UK population. This latest version of the survey is a combination of years 7 and 8 (2014/15 – 2015/16) and provides insight into the foods people eat, nutrients gleaned and adherence to public health guidance around nutrition (1). In summary, the average adult eats too much sugar and saturated fat, not enough fruit and vegetables, too little fibre and hardly any oily fish. Total fat intake is within the recommended guidelines and we all eat get more than enough protein in our diet. Vitamin and mineral intakes vary with a significant percentage of some groups not getting enough from their diet. The average fruit and vegetable intake amongst adults is 298g (similar for both men and women), which equates to less than four servings per day. Only 31% of adults manage to achieve five-a-day, which is higher in women than men (32% versus 29%). The average intake of oily fish is just 8g per day or 64g per week, which is lower than the recommended single weekly serving of 140g. The average intake of ‘free sugars’ amongst adults is over 11 teaspoons per day, which is almost twice the recommended amount. Adults barely manage to get more than 2/3 of their recommended intake of fibre and only 9% meet the guidance of 30g per day (only 4% of women meet this). So, why has healthy eating got so complicated and what is influencing our inability to meet these basic principles? For the purposes of this blog we’ll set aside the myriad reasons why people make certain foods choices. This is hugely complex and influenced by emotion, knowledge, peer pressure, access to healthy food, cooking skills, food budget and many other factors. Let’s focus on the things that have caused confusion around what it means to eat a balanced diet, which can impact on the food choices made by people who are motivated to make changes to their diet to maintain good health and reduce the risk of heart disease. Much of the diet advice we’re exposed to in the media revolves around maintaining a healthy body weight, which is one of the biggest influences over your risk of disease. Heart disease is the leading cause of premature death and is directly linked to being overweight; the conditions associated with being overweight also act as risk factors for heart disease. The basic biology of ‘eating less and moving more’ will promote a healthy weight. The idea that ‘not all calories are created equally’ is very sound but overplayed as within the context of basic healthy eating principles it’s really just common sense. You know when you’re trying to eat healthily that you should be making up your daily energy (calorie) needs from foods that fit in with the basic principles of healthy eating and not compromising this by figuring out how you can tally a couple of Mars Bars into the equation by skipping meals or eating less nutritious food. The diet industry and influence of celebrities and social media has seduced people with myriad ways to approach weight loss, which has contributed to the confusion around food choice. Making long-term small changes to your current diet whilst watching your portion size is probably the best approach but doesn’t appeal to everyone. Putting very extreme diets aside, there’s no right or wrong way to losing weight and some prefer to embark on a diet plan that lays out exactly what and when to eat. Diets can be a useful way to ‘kick-start’ your weight loss goals and in some cases can provide much quicker results, but you still need to take on board that adopting long-term habit changes is the only thing that’s going to help you to keep the weight off once the diet has ended. Attitude towards dieting is important and getting yourself in the right head space is key. Many people refer to diets in the context of a set period of time and view the end of their diet as being the point that they can start eating ‘normally’ again. However, if your definition of ‘normal’ is reverting back to the way you ate before, then what’s the point if you’re just going to end up putting the weight back on again (classic ‘yo-yo’ dieting). The best diet is only ever going to be the one you can stick with and forming new healthy eating habits is key to long-term success. Diets come in many guises and this is where basic healthy eating messages can get blurred. High protein, low carb, fasting, ketogenic and paleo are just a few examples of how people can develop false ideas around healthy eating. These diets often label foods as being somehow ‘good’ or ‘bad’, which only adds to the confusion and in some cases can lead to guilt and a feeling of failure if they fail to lose weight or stick to the program. There’s nothing wrong with dieting, just do your research and work out what approach fits in with your lifestyle. Once you’ve lost the weight then try reverting back to the basic principles of healthy eating to keep the weight off, which will reduce your risk of heart disease. There have been many books highlighted the impact of certain nutrients on health and questioned current dietary guidelines, which in relation to heart health have revolved around sugar, saturated fat and cholesterol. I love reading these books as they provide a really interesting insight into the latest science and underline some of the wider controversies that may have shaped the way we are told to eat. The concepts are very convincing in most cases, but the problem is that without a full understanding of the science of nutrition and research methods, it’s difficult to form an objective opinion and we have all been at a dinner party or sat in the pub with someone reciting the insights this type of literature offers. The problem I have is that the typical person insinuated by the text is often in the extreme, which is overlooked by the reader. Let’s use carbohydrates as an example. The idea that a high-carbohydrate diet causes weight gain, diabetes and inflammation is rightly true but what defines a high-carbohydrate diet in this instance. Whenever this is reported in the media or through books, no one actually defines this or shows you what a typical day’s food looks like for this high-carb eating person. Take a diet of excess calories made up of sugary cereals and muffins for breakfast, washed down with a coffee laden with sugar then a huge white baguette filled with something high in sat fat for lunch and an extra-large pizza for dinner, all of which are accompanied by sugary snacks and soft drinks. This is clearly not a healthy way to eat and if you eat this way then there’s a very good chance that you’re unhealthy in many other ways such as lacking in exercise. For the reader this is instantly translated as carbs are bad, but you can’t compare this diet with one that contains the right number of calories, forgoes snacking and includes porridge oats for breakfast, quinoa and chicken salad for lunch and then a tofu stir-fry with brown rice for dinner. Someone following this type of diet may also make healthier lifestyle choices such as exercising regularly. I’m not going to argue the toss over carbohydrates and it’s clear that overdosing on them, especially sugar is no good for your health, but it needs to be put in perspective to be fully understood. It’s taken a while for the nation to adapt to the message that fat isn’t all that bad and research has broadened our understanding of the role this nutrient plays in the diet and its impact on heart disease. Current advice is that we choose ‘healthy’ fats from foods such as extra virgin olive oil, oily fish, nuts and seeds, which are rich in fatty acids called monounsaturated and polyunsaturated. These fats have been shown to lower the risk of heart disease by ways such as reducing inflammation and levels of ‘bad’ cholesterol. Saturated fat in the diet has always been sold as being bad for heart health and to be honest if you’re eating a diet that’s high in any type of fat (putting keto diets to one side) then you’re at greater risk of becoming overweight, which is a risk factor for heart disease. The average adult still eats too much saturated fat but the impact of this on heart health has come under scrutiny. A landmark scientific review published in the British Medical Journal found no association between saturated fat consumption and all-cause mortality, coronary heart disease, stroke or type 2 diabetes (2). This study sparked the saturated fat debate and has further studies have contributed to a growing body of evidence that has changed the dialogue on saturated fats. The impact this study had on the topic of saturated fat in the diet and the relevance of current dietary guidance led to the publication of a report carried out by the Scientific Advisory Committee on Nutrition (SACN). The Saturated Fats and Health report was published in May (2018) after an extensive review of data from high quality cohort studies and clinical trials (3). Their findings strongly support the current dietary guidance of limiting saturated fat intake to no more than 10% of the total energy from the diet. This is translated in dietary guidelines as no more than 30g per day for men and 20g per day for women. SACN found that there were significant limitations in the available data, which may have helped to be fuel the debate on saturated fat. They also said that lowering saturated fat in the diet was needed to improve events related to heart disease. But is this insight really of any true benefit to people when they’re choosing what to eat? If you’re a healthy weight and enjoy full fat Greek yoghurt, butter, cheese or other natural sources of sat fat in moderation as part of your balanced diet then this is unlikely to have any impact on the health of your heart. However, the problem with talking about diet in terms of nutrients is that foods don’t just contain a single one. Convenience foods, pies, pizza, pastries, sweet puddings, ice cream, cakes and chocolate contain a lot of saturated fat and are also high in calories, sugar and salt, which we know is not great for heart health. Redefining saturated fat is not straight forward and runs the risk of people thinking these foods are in some way healthy and confuses the issue of food choice, particularly that related to heart health. Nutrition is often defined by individual foods and nutrients but it’s the overall quality of your diet that counts. The term ‘superfood’ has been banned by the European Food Safety Authority (EFSA), who are the body that regulates food labelling. The regulations put upon the food and supplement industry have helped to provide transparency for consumers as well as providing more information about the nutritional and ingredient content of products. These regulations do not apply to media coverage and as a result we’re still bombarded with new research findings, foods and nutrients portrayed as being superiorly better for our health, preventing myriad of diseases. The irony is that many of these foods often come full circle and contribute to the ‘kill or cure’ approach to reporting in the media. There’s nothing wrong with reading about current research, which is often fascinating, but you need to keep perspective. Blueberries, grapes, red wine and pomegranates may contain compounds that could help to prevent heart disease but including them in your diet doesn’t mean you won’t get heart disease, especially if your overall diet is poor and you make unhealthy lifestyle choices such as not exercising or smoking. The basic principles of healthy eating have been proven to help reduce the risk of heart disease and diets such as the Mediterranean have been shown to be the ‘gold standard’. Reading about the next best diet or superfood is hugely interesting but there’s no quick-fix solution to eating and living well, yet many people view these as some sort of panacea. The controversy is interesting but the outcome in terms of what we are advised to eat doesn’t really stray far from basic healthy eating principles. The real challenge is finding a way to change your habits and making the right diet and lifestyle choices that will see you through to long-term good health and this includes reducing the risk of heart disease. Colour code your health by eating the rainbow! It feels as though we are continually being told to eat more fruits and vegetables to maintain good health and keep diseases at bay, with current research suggesting that eating five-a-day is not enough to reap the health benefits they have to offer. So, what exactly is it about these nutritious colourful allies that makes them so great? The protective effect of antioxidant micronutrients such as the ACE vitamins and selenium have been understood for some time now. These antioxidants are essential to help reduce free radicals in the body (unstable molecules produced from digestion and exposure to pollution, sunlight and cigarette smoke) and they have have been attributed to lowering the risk of many diseases including cardiovascular disease, cancer and dementia. However, research has now moved forward to discover the beneficial effects of compounds known as phytonutrients that are responsible for colouring fruits and vegetables, and how they too can have a powerful effect on our health and reduce the risk of disease. Phytochemicals originally evolved to help plants protect themselves from diseases and insects and research is beginning to demonstrate that in the same way they can also help to protect us from disease. 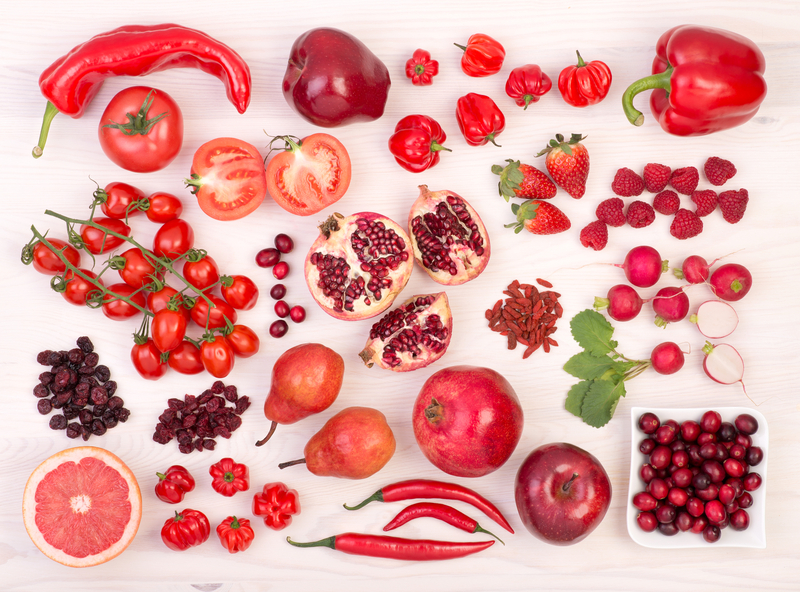 There are thousands of phytochemicals found in fruits and vegetables and as the research is new we’re only just starting to unveil their identity and extremely complex action within the body. Although the science is complex, the message is simple; eat a wide variety of different coloured foods. As nutrients in foods work in synergy and different phytonutrients can be more freely absorbed depending on their make up within the structure of the food, it’s also a good idea to not only mix colours and types of fruits and vegetables but also cooking methods combining raw with cooked (such as adding roasted sweet potato or tomatoes to salad). By dividing different fruits and vegetables by their hue you can see how mother nature has allowed us to colour code our health by eating a rainbow of foods. Benefit: Most red fruits and vegetables contain lycopene, which is a member of the carotenoid family which are converted into vitamin A within the body. This vitamin along with vitamins C and E help to protect the body from free radical damage. Studies show that Lycopene* may reduce the risk of prostate cancer as well as helping to promote good colon health. Red berries contain ellagic acid (helps to support the immune system) and anthocyanins, which research suggests reduces inflammation and help preserve memory whilst helping to slow down the degenerative processes of ageing. These are also considered to be protective against certain cancers and cardiovascular disease as well as showing antiviral and antibacterial properties. *Lycopene is more freely available in processed or cooked tomatoes. Try roasting cherry tomatoes with balsamic and a little olive oil, which helps with the absorption of lycopene. Benefit: The key antioxidant found in orange and yellow fruits and vegetables are carotenoids (also found in green leafy vegetables). These are converted to vitamin A in the body, which is essential for healthy skin and eyes. 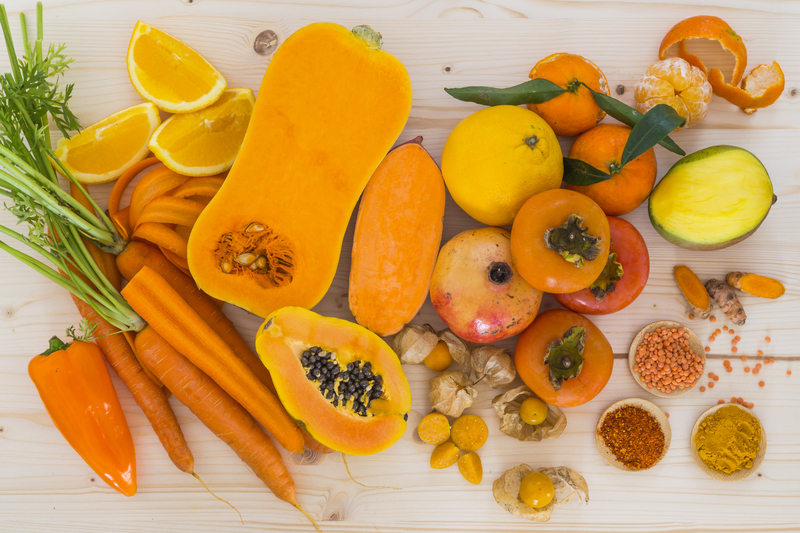 Beta-carotene has been linked to a reduced risk of heart disease and certain cancers as well as playing a role in the immune system, reducing cognitive decline and possibly dementia risk. You will also find a group of compounds in this hue known as bioflavonoids which studies suggest reduce inflammation in the body and may also work to slow down the development of cancer, heart disease and neurodegenerative diseases such as Alzheimer’s and Parkinson’s. Combining your orange foods with healthy fats found in avocados or oils will help with the absorption of carotenoids. Try drizzling olive oil over roasted butternut squash. Benefit: Lutein (found also in yellow fruits and vegetables) and zeaxanthin found in green vegetables are major pigments in the eyes and important for the maintenance of healthy vision. Studies have shown that people who eat higher amounts of these compounds in their diet have a lower risk of developing age-related macular degeneration (AMD) which is a major cause of blindness as we age. Zeaxanthin may also help to reduce the risk of breast and lung cancers, and play a role in the prevention of heart disease and stroke. Leutiolin is another antioxidant found in green peppers and celery which has been found to lower inflammation in the brain and central nervous system. 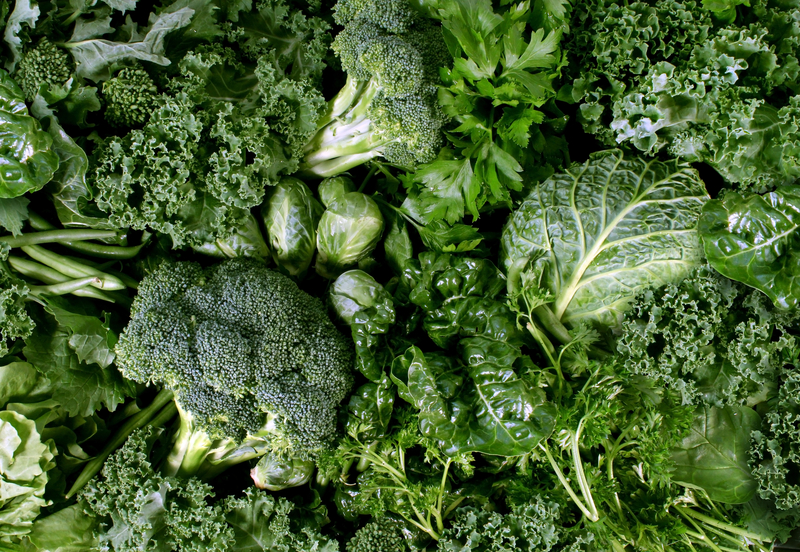 Green foods also contain quercetin which also has an anti-inflammatory effect within the body. 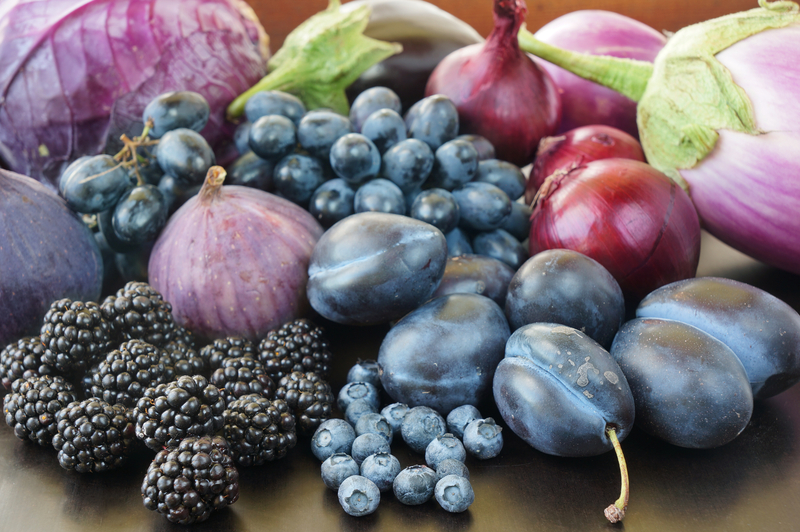 Benefit: Anthocyanins are present in this colourful group of fruits and vegetables. These compounds are thought to reduce inflammation, which may help with preservation of memory and reduced risk of certain cancers. Blueberries have been the focus of research into the effects of anthocyanins and reduced mental decline (including Alzheimer’s). Purple grapes are especially high in a type of polyphenol known as resveratrol, which has been shown to protect against heart disease and promote a healthy circulatory system by reducing the levels of bad blood fats and blocking the formation of blood clots (which can cause heart attack and stroke). Blackberries contain ellagic acid and catechins, which may help to protect against cancer. Benefit: Although not strictly a colour of the rainbow, white vegetables also contain a variety of phytonutrients that can have a protective effect on your health. Onions and garlic contain quercetin and allicin, which are known to kill harmful bacteria and protect capillaries (smallest of the body’s blood vessels). 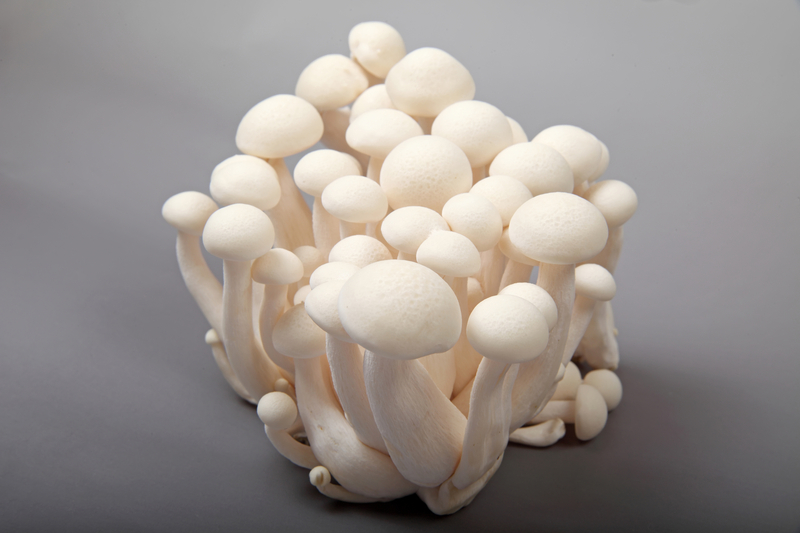 You will find powerful polyphenols in mushrooms which can help to reduce the risk of heart disease. Glucosinolates and thiocyanates found in cauliflower may also help reduce the risk of heart disease and cancer as well as help with digestive disorders. These delicious pancakes make a great breakfast or brunch. Rye four is a good alternative for people who are trying to eat less wheat. The blueberries are rich in plant compounds called flavonoids that act as antioxidants in the body and have been shown to help protect against disease. Place the flour and salt in a large bowl. Separate the eggs and add the yolk to the bowl with the flour. Pour in the almond milk and beat with a wooden spoon. Place the egg white in a medium-sized bowl and whisk until soft peaks start to form. Fold 1 tbsp of the egg white into the pancakes batter then add the remaining egg white and fold very gently to retain the air. Heat the oil in a large non-stick frying pan. Add 1 tbsp of the mixture at a time to the pan (you will be able to fit 4-6 pancakes per batch). Once air bubbles start to form on the top of the pancakes (after about 1-2 minutes), flip them over and cook for a further 1-2 minutes until lightly browned. Transfer the pancakes to a plate and repeat until all the pancakes are cooked (keep them warm by covering the plate with foil. To make the compote, place the blueberries, ginger, lime juice and honey in a small saucepan and bring to the boil, stirring gently. Once boiling, turn down the heat and cook gently for about 5 minutes until some of the blueberries start to burst. Once done, remove the pan from the heat. To serve, place 3 pancakes per person on a small plate, spoon over the compote and top with 1 tbsp of yoghurt. 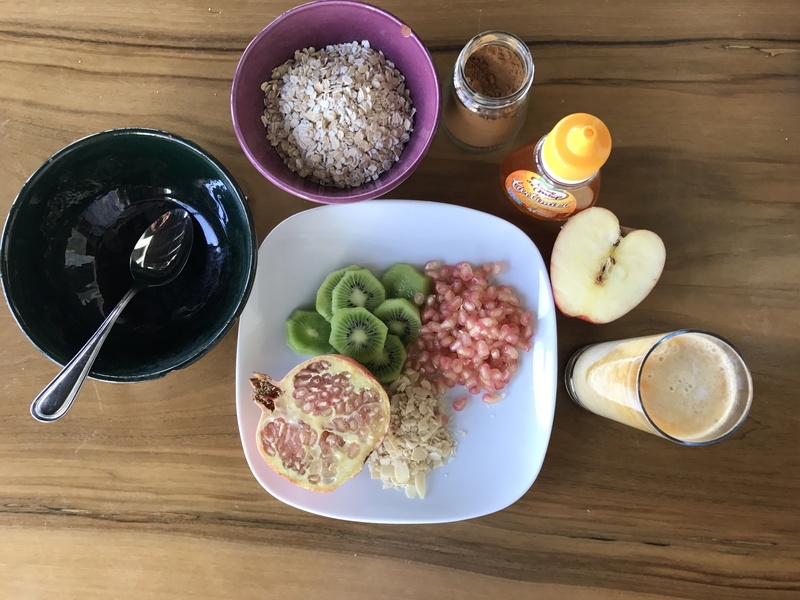 This muesli makes a great breakfast to start your day or even a nourishing snack (I like it after training or as a bedtime snack). Oats are loaded with soluble fibre that aids digestion and helps keep you full whilst balancing blood sugar levels. One group of soluble fibres are the beta-glucans which have been shown to help lower cholesterol – good news for your heart! Place the oats in a large bowl and cover with the apple juice, milk, cinnamon, lime zest and honey. Combine well and cover. Place in the fridge for 20 minutes. Remove from the fridge and stir through the grated apple. Add more almond milk of a little too thick. Top with kiwi and pomegranate.